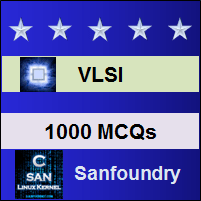 This set of VLSI Multiple Choice Questions & Answers (MCQs) focuses on “Counters and Finite State Machines”. 1. Counters detect only bridging faults. Explanation: Counters detect gate level struck-at faults and bridging faults of the circuit under test. 2. How many test patterns are required to test the circuit using counters? Explanation: A n-bit counter, generates 2 n possible test patterns which is sufficient to completely test n-bit combinational logic circuit with no feedback. Explanation: The testing using counter method is practical for lesser value of N such as within 22 to 25 since for higher values of N more number of clock cycles are necessary. Explanation: The least significant bit toggles every clock cycle and the most significant bit toggles every half way through and at the end of the count sequence. Explanation: Finite state machines are used for algorithmic test pattern generation testing for the circuit under test. 6. Address ordering minimizes the logic of finite state machine. Explanation: Address ordering either ascending or descending order in the first and last loop minimizes the logic of finite state machine. Explanation: In finite state machine, there are separate ports for DATA IN and DATA OUT and this is a typical RAM structure. Explanation: With the use of active high synchronous reset (clear) read and write operations in a finite state machine can be done. 9. Finite state machine will initially set to all zeroes. Explanation: Finite state machine has initial state initialized with all 0’s whereas LFSR and CA has initial state with any state other than all 0’s. Explanation: The fault coverage and area overhead is better when the initial state is initialized to all 0’s in finite state machine.